Perhaps you sow seeds fresh… which plants do you find the most success with? Hands up… yes, I am a filler of little brown envelopes with seeds from my garden. Being really truthful, I also find myself quite OTT with my collecting once I start! Oops… and I am partial to buying seeds when I see an offer too… 50% off and I’m picking up seeds as maybes. Lol… I like the thrill of what I could grow. A hopeless case I am, I know… I hear you laughing… does this sound familiar to anyone? Okay... although I do love my little brown envelopes for storing seeds I came across a blog last year on seeds being stored in spice jars by fer at my little Garden in Japan. It’s great that through comments we discover new blogs/bloggers isn’t it? Coming back to those home packed little brown envelopes of seed… you have to be careful where you store them. A dry place is essential. Keeping the sealed envelopes in a tin or plastic container is worth considering too but only if your seeds are completely dry. I wish I had. Coming back to the bags for collecting larger seed heads that need to dry before releasing their seeds (like alliums) what kinds do you use? I tend to use completely paper but they are not always easy to find in shops I know. Where do you find your bags? In response to the comment in my last post: “Okay, million dollar question! 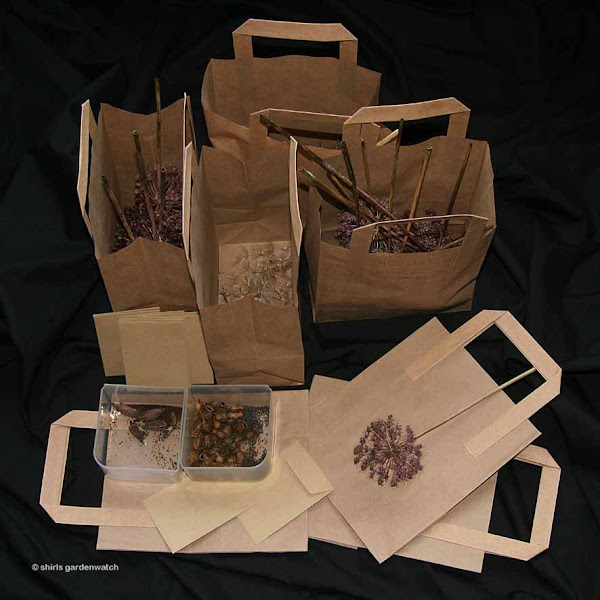 Where did you get the paper bags for the seeds?” asked by fellow Scottish blogger Janet, I got mine in a small stationary/print shop in the City of Perth. Danscot is at 6-8 Kinnoull Street, Perth although they also have a larger trade unit at the North Muirton Ind Estate. Now… I’m all set for a dry day or two of seed collecting… are you? A lot of your comments sounded so like mine. LOL!I have seed heads and baggies hanging as we speak.LOL! And I know I will not use them all but give many away.I love sharing seeds. Where I slack in seed collecting is not having a filing system for them but throwing all the little envelopes into a plastic container.This makes me shake my head because I am a stickler for keeping plant records. LOL! Very posh bags, Shirley but awfully nice and you can hang them up. I have the wages envelopes but all the way to Perth for bags? There must be some here. I have been known to pick up a few bags other places. I'm sure folk can work out from where and what they are normally used for.. Thanks for answering my million dollar question. I'd imagine the paper bags can be found in places like Hobbycraft, but I've never actually looked to be sure. I get the little envelopes from WHSmith, generally classed as wageenvelopes. No seed collecting just yet, although I do plan on collecting some poppies from my parents as they've had some amazing blooms this year. Tbh they're the only seeds I plan on... Oh and some Foxglove species I'm yet to post about - blog post written and it's sat waiting for me to decide to post it! My envelopes then go in one of those kitsch seed boxes with little sections for each month... However they're now all jumbled up and I don't plan on sorting them out! lol. What a fun post. Seeds aren't fussy about their bags. For seed heads, I buy a packet of paper lunch bags at the grocery or dollar store. For little packets of seeds, I use coin envelopes from an office supply or stationer. I saved pill bottles for bigger, bean sized seeds like castor beans. I have such rotten luck with seeds. It is a wonder that I collect any in our garden but collect I do. I just can't resist those little (or large) seed pods. I put them into envelopes that my cousin gave me and write the name of the seed and date. Your big bags are nice to collect the seeds. I found seeds in my ear the other day after scattering some columbine seeds. Ha.. Your photo deserves to be in a magazine..how beautiful. Great blog entry Shirl. My paper bags are not nearly as smart as yours ))).